Can't tell which AC adapter belongs to which device? Avoid accidentally unplugging the wrong generic black cable with Dotz Cord Identifiers. 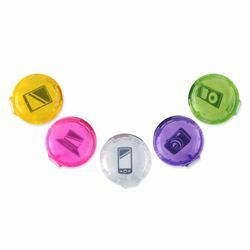 Label the plug-end of your cords by snapping on the 5 reusable cable Dotz with 10 punch-out labels, pre-printed with illustrations of common electrical devices.